* NBC announced on December 18, 2008 that there will be a sixth season of Ghost Hunters in 2010. GHOST HUNTERS Official web site visit here now! The one-hour weekly reality series follows a group of real-life "ghostbusters" as they investigate haunted houses and establishments throughout the country. Enjoying record-high ratings throughout its series run, Ghost Hunters has featured speaking entities, mysteriously moving furniture, ghostly visages and a healthy dose of squabbling within the investigating team. Being scared has never been so much fun! From the new fad of actual Virtual Ghost Hunting to all the latest news and info that you could hope to have. The internet has brought many changes to the research and understanding of all that is considered paranormal research and investigation. And it has also changed over the years how Grant and Jason hunt for the elusive ghosts they find. They also have a great paranormal fan site that examines paranormal claims and evidence they gather with a critical eye. Many of us can't wait until Halloween to see the shows actual live Paranormal Investigations. Not only are they fun for them but for those of us that can't get out and hunt for actual ghosts for whatever our reasons are. Each year they host their live show with special guest and an hours and hours of virtual ghost hunting to our personal delight. Ghost Hunters is a reality television series featuring Jason Hawes and Grant Wilson, who work a day job as Roto-Rooter plumbers and by night investigate places that are reported to be haunted. And we the public with our scrutinizing awareness replay every scene until we see or believe what we want to believe. Many of us in the paranomal field have changed our methods because of how we see T.A.P.S. perfoming each week. Many think they give us a bad name. And when watching the show you realize that they may lack perfroessional ethics or they are just too scripted. Jason Hawes and Grant Wilson, along with other team members who belong to the group they founded, The Atlantic Paranormal Society (TAPS), investigate locations of interest by using various electronic equipment which they believe is capable of detecting paranormal activity. When investigating a location, TAPS team members first survey the property with its owners, who describe their experiences at the site. Next, the team sets up electronic equipment in the apparent paranormal "hot spots." The TAPS team then spends several hours taking EMF and temperature readings, recording audio for EVPs, and filming with digital video cameras. Many times, they will even try to verbally coax the "ghosts" into responding, while recording. Afterwards, the team spends several hours analyzing all of the data for signs of possible paranormal activity. A few days after reviewing the information, Hawes and Wilson discuss their findings with the location site owners, offer suggestions for dealing with any apparent activity, and answer any questions the owners may have. And now we the viewing audience now can buy the DVD's or watch a youtube of the actual evidence over and over again to analyze it at our leisure. Since the show began airing, TAPS has recorded thousands of hours of audio and video data. Most investigations, according to TAPS, turn up cold with very little, if any, paranormal activity occurring. The ghost hunters claim to have several good recordings of strange mists, odd lights, moving objects, and shadowy figures that manifest before the camera and disappear quickly - all highlighted at the end of the show. TAPS does not believe every piece of evidence gathered is proof of the paranormal. To lend credibility to their investigations, the team tries to debunk what they find and look for reasonable explanations for things such as "cold spots" (that may be drafty windows), "moving objects" (that may have been accidentally bumped or tugged), "phantom lights" (that may be reflections of light from a passing vehicle), and "strange noises" (that may be a thumping branch or vermin in the walls). In addition to the investigative aspect, the show highlights personal conflicts and relationships among members of the TAPS team, which may be why the Sci-Fi Channel categorizes the show as a docu-soap. In earlier episodes, part of the hour showed Jason and Grant during their plumbing job or personal lives but that has diminished since then. With the many videos and ghost Cams on the web we are able to watch for all the truths and supposed sightings of ghosts monsters and what ever goes bump in the night. The computer has become one of the most cherished tools any Ghost Hunter could own. TAPS' equipment includes digital thermometers, EMF (electromagnetic field) scanners, infrared and night vision cameras, handheld digital video cameras, digital audio recorders, and laptop computers. The team has also experimented, in at least one episode, with a geiger counter during their investigation to see if it would register any anomalous readings. Starting around the third season, the team has used the K-II EMF detector which uses a series of LEDs to meter the strength of an energy field instead of a numerical LCD display. During the Manson Murders investigation in particular, the team used a K-II meter in an attempt to get "yes" and "no" responses to verbal questions posed to a supposed entity in a room. In the fifth season "Edith Wharton Estate" case, the team introduced two new pieces of equipment. One is a custom made geophone which detects vibrations and flashes a series of LEDs that measure the intensity of the vibration. The second is a new EMF detector that makes a buzzing sound while in the presence of an electro-magnetic field and the stronger the field, the louder it buzzes. In the episode, the geophones were recorded on video flashing to the vibrations of what sound like footsteps across a floor even though no one was supposedly in the room. Other gear not typically shown on screen are an Ion Generator — a device that charges the air with electricity and theorized to help spirits manifest, and the White Noise Generator — an audio device that makes a static background noise and theorized to act as a catalyst for assisting entities in making EVPs. Ghost Hunters has garnered some of the highest ratings of any Sci-Fi Channel network programming. From the start, the show has found an audience for its mix of paranormal investigation and interpersonal drama. It has since been syndicated on NBC Universal sister network Oxygen. In the early shows, TAPS was headquartered in a trailer located behind Jason Hawes' house, and they drove one white van to investigations. Within one season, they had moved the entire operation to a storefront in downtown Warwick, RI, and acquired several new TAPS vehicles equipped with surveillance instrumentation. In addition to their successful television venture, TAPS operates a website where they share their stories, photographs, and ghost hunting videos with an ever-growing membership list. Because of the popularity of the show, TAPS cast members have signed contracts with at least two talent agencies, Escape Artistry and GP Entertainment, to manage their appearances at lectures, conferences and public events. In addition to the success of the television show, TAPS have ventured into the venue of radio broadcast hosting a 3 hour weekly show called "Beyond Reality". New episodes are broadcast every Saturday from 7 - 10pm EST, though sometimes may skip a week with possibilities of the hosts being busy with other ventures. The radio show goes into topics in a vast array of areas such as cryptozoology, spiritualism, UFO's, and ghosts. The show is hosted by Grant Wilson and Jason Hawes, and includes guest appearances from other TAPS members and special guests like John Zaffis, Rosemary Ellen Guiley, Chris Fleming and others which specialize in certain fields. Ghost Hunters has attracted various critics and skeptics, such as Joe Nickell of the Committee for Skeptical Inquiry, and Skeptical Inquirer author, Lynne Kelly,James Randi, and Benjamin Radford. 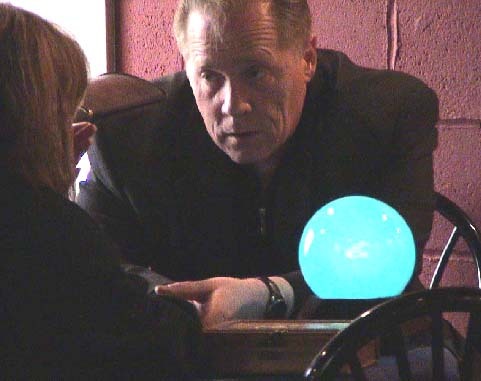 The Skeptical Analysis of the Paranormal Society (SAPS) was founded with the intent to recreate and debunk segments of the show. Critics point to a lack of scientific methodology and critical examination in their investigations as well as questionable production aspects involving editing, action that is rarely captured on tape, and findings that are unsupported by evidence. Tools are used in ways that are not proven effective, or in ways in which they have been proven ineffective, such as infrared thermometers that are claimed to detect cold spots in the middle of rooms when such tools are able only to measure the surface temperature of objects. Techniques with thermal imaging cameras, Geiger counters, electronic voice phenomenon, and EMF detectors are used with little or no explanation as to how the techniques have proven to provide evidence of ghosts or other entities. Concerns with regard to how the devices are used are common, such as how Benjamin Radford puts it in an article for CSI, "you may own the world's most sophisticated thermometer, but if you are using it as a barometer, your measurements are worthless. Just as using a calculator doesn't make you a mathematician, using a scientific instrument doesn't make you a scientist." Controversy followed the seven-hour long, live Halloween show on October 31, 2008 where at least two events took place that critics have attacked: One is where Grant Wilson, a lead investigator, has his jacket collar pulled down by an unseen force three times, all the while one of his hands remained suspiciously at his side which lead detractors to claim he was pulling a hidden string. Another is when a supposed disembodied voice tells the hunters, "You're not supposed to be here." Critics have claimed the voice sounded as if it was piped in from an external audio source. Video of the incidents have been meticulously scrutinized on various website's. In regards to the scrutiny, Grant and Jason defended themselves stating that they are accused of faking evidence all the time and maintain that everything in the show is real. For more please visit www.scifake.com. Ghost Hunters: College Edition On October 23, 2008, TV Guide reported that Sci-Fi will launch a spin-off of the show called Ghost Hunters: College Edition, which will feature co-eds in the ghost hunter roles. Starring on the SCI FI Channel's Ghost Hunters is The Atlantic Paranormal Society (or T.A.P.S. for short), a team of paranormal researchers captained by Jason Hawes and Grant Wilson, and they aren't afraid of no ghosts. Click Continue for a list of eight essential devices the real Ghost Hunters utilize in the field, and learn what separates the hunters from the haunted. The trusty workhorse of many a professional photographer, a good ol' fashioned film camera takes a little more skill to wield than its digital brethren. Learn to use it, however, and it'll pay off in spades. Film is easier to enlarge when processing an image (to spot all of these teeny tiny ghostly details), less erratic with its light sensitivity, and, maybe most importantly, it's harder to fake a film image. When a ghost starts moaning or knocking on things, you want to make sure you get a nice, clean copy — not a tape full of muddy noises and audio flaws. That's why many ghost hunters choose a digital recorder over using analog tapes. With digital, you can also be sure you're picking up everything within and beyond the range of human hearing. See-through apparitions aren't necessarily the most photogenic models around. For haunting visages invisible to the human eye, you'll want to pack an infrared-ready camera to keep tabs on sneakier phantoms. As you more or less have to keep an infrared sensor scanning continuously to make sure you don't miss anything, it's a good idea to send its feed to a hard drive where the footage can be stored and studied later. Whether you're confronted with Casper the Friendly Ghost or something that looks like it stepped off the set of the X-Files, you're going to want to make sure you get all of it down. Digital video cameras offer a lot of flexibility when it comes to storing and capturing moving images. For instance, you can get one with plenty of internal space like a large hard drive built-in, or a model that records on several different formats, such as DVDs and MiniDV, so you can swap on the fly and never run out. Ghost sightings often happen fast and in a major way. If you don't want to miss anything, you'll need more than just visual and audio equipment to record all relevant data. Setting up a digital thermometer is usually a good idea. Temperature changes frequently accompany the presence of the paranormal, and a digital thermometer can stream continuously updating measurements to your equipment. Similar to the digital thermometer, the EMF recorder will keep you abreast of whatever electromagnetic fluctuations occur during a sighting. EMF recorders aren't employed by all ghost hunters — many discount them because all kinds of things (televisions and other appliances, for example) emit electromagnetic fields, but the thorough ghost hunter is the one with the most evidence. Unfortunately, given the creepy nature of hauntings, many ghosts won't want to come out until it's good and dark. You don't want to stumble around when candlesticks are flying across the hallway, so you should probably take a pair of night-vision goggles for low-light situations. In absolute darkness you'll need infrared, but for most situations the light amplification night-vision specs provide should be more than enough. Where the digital thermometer gives you a rock-solid record of your bone-chilling experience, a thermal-imaging sensor on a digital camera will give you visual proof. Thermal imaging is enormously useful as you'll be able to see how big hot and cold spots are and how they affected the environment around them during a haunting.